The Order of Belfry is a female knights and girls love comic, yeah you read that right! We are very excited to finally bring this story to life. If you are into knighthood and the pursuit of love and honor, then this is the place for you. 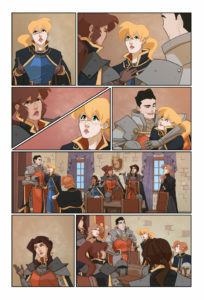 The comic follows the development of war between two kingdoms through the eyes of an all-female knight order. The kingdoms of Cervidae & Rosoideae have been at war for five years. With the death of the eldest son of the Cervidae Royal Family, command of the kingdom’s forces had gone to second son Hans. 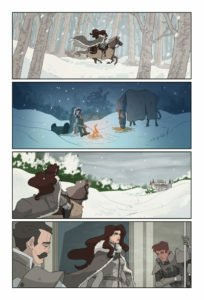 When Hans is captured, his younger sister Idina calls for an immediate rescue attempt. Her father, the King, is reluctant to commit his forces without better odds for success. Being the kind of princess who takes action rather than sit quietly at court, Idina sets out on her own, determined that her brother wouldn’t sit in captivity another day. Sadly, a lone knight would need more than determination to mount a successful rescue. Worse than the injuries she suffers at the hands of the Rosoideae commander, Bastion, was having to face her father’s wrath at being disobeyed. To keep her out of the way while the men handled the fighting, Idina is shipped off to Castle Belfry for safe keeping, with the other highborn women of Cervidae. However, the king isn’t as in touch with the goings on in his kingdom as he thinks, for the Ladies of Belfry aren’t at all satisfied with living under guard, safe and secure behind their walls. I received an email from Barbara Perez, co-creator and writer for this webcomic of medieval honor and war, asking if thePullbox would be willing to take a look at the work she and MJ Barros have done. 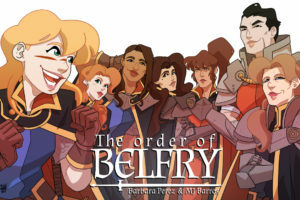 I took a look, and fairly early on it was pretty apparent that The Order of Belfry was a solid bit of storytelling. Perez manages to portray the world, and the characters in it, as equal parts heroic & flawed. Idina is obviously hot-headed, like so many heroes of literature who’ve come before, but there’s no doubting her moxy. Perez lets her characters be who they are, and it amounts to some solid storytelling. The dialogue is smooth and natural, not at all choppy or overly formal as is found in some independent works… by itself, that sets Belfry out ahead of the pack. Also in her favor, Perez does a great job of writing her story with the ideal of “show, don’t tell” in mind. Characters are able to establish their relationships without pesky text boxes informing readers “these two don’t like each other”. It just shows in their interactions. Of course for that sort of storytelling to work, a writer has to be partnered with an artist who understands what it is she’s going for… well, read on. Sharing the creative load is artist MJ Barros, and when it comes to laying out the medieval world of knights, ladies, and kings, she’s a force to be reckoned with. It’s interesting that her chosen style in The Order of Belfry is a brightly colored one… Nowadays, it seems like everyone’s going grimy and gritty when it comes to the medieval setting. What I like about the brighter tone is that it sets up what the story’s more about. It’s a more idealized take on the age of myths and legends, with the emphasis being put on larger than life characters instead of the slaughter and mayhem. That’s not saying that Barros’s work is lacking at all in the action department. She approaches her sword fights with not a shred of hesitancy, as willing to disembowel an attacker as she is to permanently scar a main character (minor spoiler: Idina doesn’t come away from her failed rescue mission untouched). 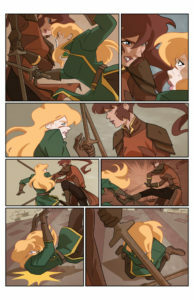 What’s more, Barros does a good job of helping out with the “show, don’t tell” storytelling with her attention to detail. If you’re not sure about what’s going on in a given scene, pay attention to the facial expressions and body language of the characters involved… their little quirks and actions are giving away more information than you might think. 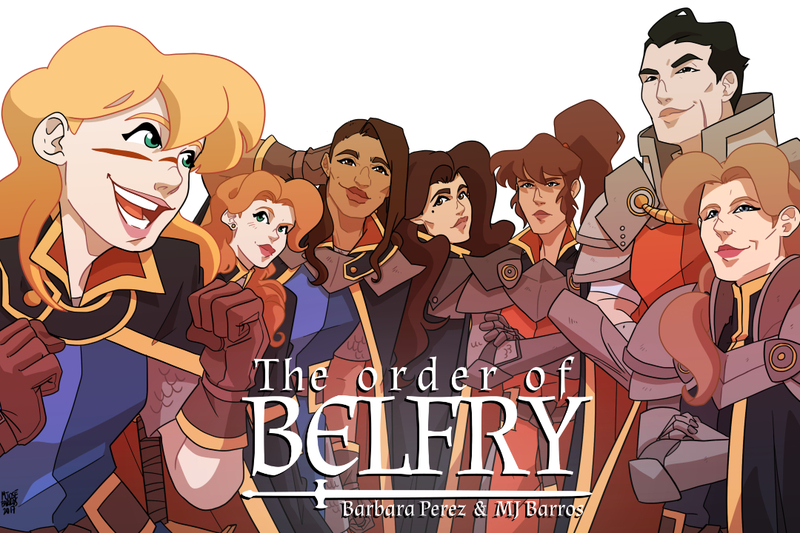 All things being equal, The Order of Belfry is a decent piece of work. If you have any interest in stories of valor, of knights riding across the countryside to do battle on the field of honor, this is absolutely worth a look. And if it’s strong-willed women you’re looking for, taking destiny in their own hands rather than be kept safe and secure like pampered pets, I can’t think of a better place to look than right here… A story created and crafted by women, about women breaking away from societal standards. So what’re you waiting for? Get thee hence!